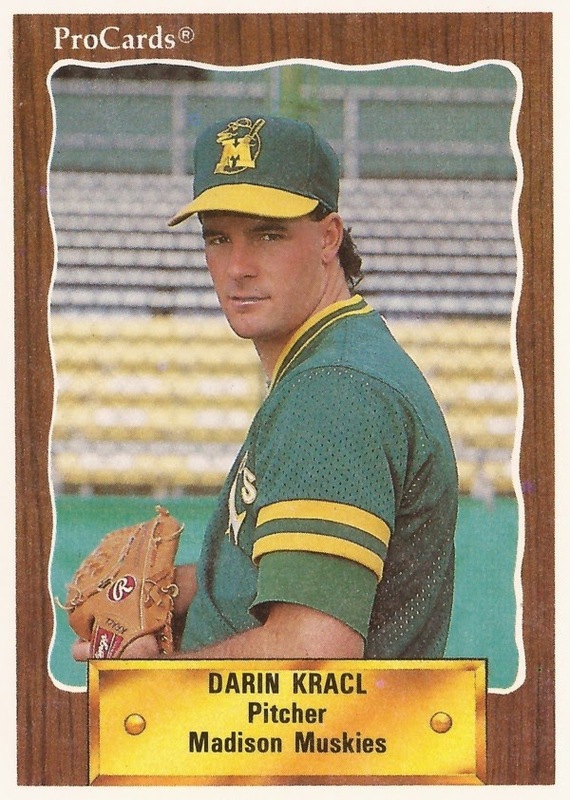 Starting against top-ranked Texas A&M, Brigham Young's Darin Kracl lasted just four outs in that late May 1989 game. He stayed in long enough to give up 11 earned runs. "Really, that was a counterfeit outing by Kracl," BYU coach Gary Pullins told The Deseret News afterward. "He was throwing the ball right down the middle, or walking them." Oakland apparently decided that outing was also out of the norm for Kracl, selecting him that June in the fourth round of the draft. That started a professional career that lasted just three seasons, never getting to AA. But Kracl would have other counterfeit outings, just not on the baseball diamond. He was charged in 2008 and later convicted on allegations stemming from securities fraud. Investigators eventually determined he bilked from investors a total of $6.7 million, only $2 million of which had been recovered by 2009. And that came after a January 1992 conviction for misdemeanor theft in Orem, Utah, a reduction from a felony, according to The Salt Lake Tribune. That 1992 conviction coincided with the end of his three-season baseball career, though it was unclear if one had anything to do with the other. He would return to the field one more time, though, in spring 1995 for replacement ball. Back in 1989, though, none of that had happened. Kracl was a right-hander out of San Leandro, Ca., playing for BYU. He'd played baseball, football and basketball at San Leandro High, and even was struck on the mound by a line drive at a high school All-Star game. The resulting cut required 40 stitches to close, according to BYUCougars.com. His stats that year, his junior year, were 7-5 with a 6.55 ERA. In his first 27 innings, though, he had a 2.00 ERA. In April, he had a complete-game, five-hitter. In class, Kracl majored in recreational management administration. As a pro, Kracl started at short-season Southern Oregon. In 15 starts, he posted an ERA of 3.69 and led the league with 10 wins to one defeat. He also faced Spokane in the playoffs, having beaten them soundly in one outing and got a no decision in a second. "He was getting behind the hitters (last time), getting behind in the count," Spokane right fielder Jeff Barton told The Spokane Chronicle of his assessment of Kracl. "He was forced to come in with his fastball." Coming off that year, Kracl moved on to have another stellar season at single-A Madison. He went 10-2, with a 1.98 ERA. A 12-game look at AA Huntsville that year, though, proved less than stellar. He went 4-6, with an ERA of 7.12. His final season came in 1991, in the high-A California League. Between Modesto and independent Reno, Kracl went 3-8, with an ERA of 5.68. Kracl went on to leave baseball, working for a time for Federal Express. When he returned for replacement ball in 1995, Kracl signed on with the Tigers. In one six-inning stretch, he didn't allow a run. The strike over, Kracl joined independent Corpus Christi for 14 final outings. By 2007, Kracl had signed on with the St. George Roadrunners of the Golden Baseball League as pitching coach. He also became a managing partner in the team when a new ownership group came in that May. He was ejected from an August game for arguing a trick play. By 2008, he was under arrest. Before a July 2009 auction of a memorabilia collection Kracl had amassed, the Utah Attorney General's office described Kracl as "a con man who promised riches" to clients, but never delivered. He didn't even have a securities license. Kracl claimed high profits, of as much as 200 percent, in foreign securities trading. The money, however, went into Kracl's own pocket. He purchased vehicles, sports memorabilia and even put it into a minor league baseball team, an apparent reference to the Roadrunners. "This auction," Utah Attorney General Mark Shurtleff said in a statement, "is a chance for Utahns to own a part of sports history and help make some fraud victims whole at the same time." Kracl was ultimately sentenced to 90 days in jail and ordered to immediately began restitution payments upon his release. With $2 million recovered, the total restitution owed by Kracl then amounted to $4.7 million. If he breaks the terms of the agreement, Kracl could face up to 15 years in state prison.